Discounted Mardi Gras Game Tickets will be available from now until Wednesday, February 27th for 5/$1.00. 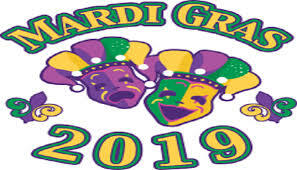 (After Wednesday, February 27th they will be 4/$1.00) If you would like to purchase tickets ahead of time please send your money in an envelope clearly marked for Mardi Gras with the dollar amount as well as your family name on the outside of the envelope. **Will Call Tickets*** The tickets will be available at a Will Call table in the connector the night of Mardi Gras. They will not be sent home with your child. Tickets will be filed under your last name. No discounted tickets will be sold after Wednesday, February 7, so send your orders in now! We would greatly appreciate donated baked goods for the Cake Walk. Items such as cookies, cupcakes, cakes, brownies, Rice Krispy treats, etc. work well. Please wrap homemade goods in dozens and keep store bought goods in original packaging. Pies and cakes will be raffled whole. Bakery items should be sent to Mrs. Trentman’s classroom on either Thursday, February 28, or Friday, March 1. Thank you! Please send Basket Raffle donations to school by Tuesday, February 6, so we have time to put the baskets together and display them before Mardi Gras. Thank you so much for your support of this evening! It benefits our students through purchases of extra classroom supplies, activities, and teacher workshops.